It’s a Simple Quilt to Make, Too! 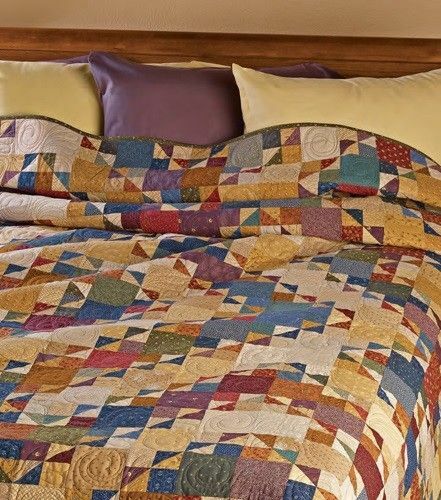 Lots of scraps and simple piecing come together in a beautiful quilt. All of the colors are somewhat muted, allowing the large variety of fabrics to create a coordinated whole. The light fabrics are deeper in value than you often see, adding to the lovely blending of colors. The quilt will be wonderful in stronger colors, too. Just be mindful of value placement so that the interesting overall design emerges. 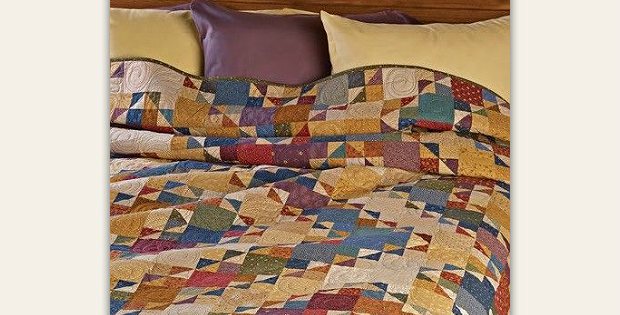 Give the quilt whatever personality you prefer through fabric selection. It will be stunning in vivid colors and strong contrasts, sweet in 1930s prints, and interesting in plaids and other strong prints. The design lends itself to many interpretations. The finished quilt, designed by Janet Mednick, is 88” x 96”. Instructions are also included for a crib quilt and other block layouts. Click here to purchase the “Winding Road” quilt pattern. PLEASE NOTE: Quilting Digest has featured many patterns from vendors participating in the Craftsy Marketplace, most of which have been deleted by Craftsy. It's going to take awhile for us to hunt down new sources for those patterns. In the meantime there are many links to patterns on our site that no longer work. We apologize if this article contains one or more of those links and appreciate your patience while we straighten things out. Thank you! PLEASE NOTE: Quilting Digest does not sell or otherwise provide patterns directly. We showcase patterns and projects from various vendors, bloggers and other sources. Please make a note of where you access a pattern (the link in the yellow box toward the end of each Quilting Digest article). That way you can contact Support for that source if you have downloading problems or other issues. Thank you! Affiliate Disclosure: Quilting Digest is a participant in the Amazon Services LLC Associates Program, an affiliate advertising program designed to provide a means for us to earn fees by linking to Amazon.com and affiliated sites. Quilting Digest also participates in the affiliate programs of various other merchants who provide quilting and sewing related products. Affiliate commissions allow us to continue to provide interesting and helpful content for our readers. Thank you for supporting us through your purchases from these merchants. Copyright © 2019 Quilting Digest.